10-May-2010 -- From the previous visitors' narratives, this looked like an easy confluence: Just follow the GPS along the roads to the area where the point is located, then walk 300m or so along the boundary fence between two fields to get within 10m. However, the final 5-6 km to the confluence when simply following my GPS from Bratislava turns out to follow a pretty bad gravel/dirt road leading to a farm located about 3 km south of the point. From there on farm equipment, most probably large tractors, had completely chewed up the road, leaving ruts 25-35 cm deep! 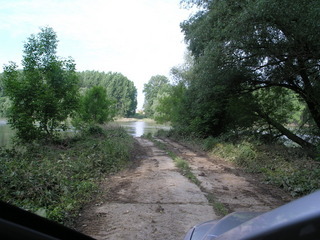 Since this was an obvious barrier to my small rental car, I tried to take the initial road further east to attack the point from the opposite direction, but here it turned out that the "road" which Garmin told me to follow lead directly into the river, with no bridge in sight. This must be a place where tractors and large trucks can ford the river in periods of very low water level. At this point I reversed the car and drove all the way back to the paved roads, then spent the next 15 min or so trying to find a way around to the north, but then I ran out of time as I had to prioritize the network troubleshooting which was the real reason for the trip to Slovakia. Any future visitors would do well to approach this point from the Zemné village to the south!